Almost a century after Jewish factory owner Leo Frank was convicted of the murder of his worker Mary Phagan in Atlanta, the case continues to captivate audiences and filmmakers. Then and now, controversy about his guilt - and deep horror about his eventual lynching by a white mob in an Atlanta suburb - have made the case unforgettable. 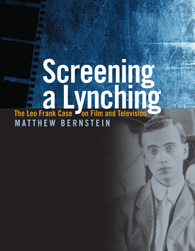 In his new book, "Screening a Lynching: The Leo Frank Case on Film and Television" (The University of Georgia Press, 2009), Professor and Chair of Film Studies Matthew Bernstein dissects four screen treatments of the case. While they span more than half a century - and include one by a self-taught African American filmmaker - Bernstein explores what's behind the ongoing fascination. Listen to Matthew Bernstein discuss the Leo Frank case and his new book. Listen to Mathew Bernstein read from "Screening a Lynching."